Metal Gear Solid is a series that has adapted and changed over the years, mutating, always reaching, grasping for something, every entry offering something new. It has always been hungry. Metal Gear Survive continues that tradition, but not in the way we are accustomed to. We are used to Metal Gear Solid switching characters, we are used to seeing new settings, but we are also used to the core mechanics and controls varying wildly between games. Instead, this spinoff takes the template that is Metal Gear Solid V, mixes it with survival elements, and fills the map with zombies. The first game without series creator Hideo Kojima, taking that template is possibly one of Konami’s best ideas. Metal Gear Solid V’s mechanics are a solid foundation to work from, it controls like a dream, and the stealth feels slick and intuitive. It is a good way to ease us in before trying to pick the story back up again where Kojima left off, without alienating series fans. Combat in Metal Gear Solid V also felt amazing, but the game never really had much opportunity to show it off - stealth always felt like the right way to play. In Metal Gear Survive, we will be fending off hordes of angry, crystalline zombies from another dimension. That gun you have? It won’t just be for show. Saying that, stealth will be just as important as ever. Only this time sound is more important than camouflage. Bumble into something and you will bring the horde down on your head. Fights when you are gathering supplies will eat at your resources. You have to play clever. There are also a range of melee weapons in Metal Gear Survive, adding a new layer of tactical considerations to combat. Put up a fence in the right place and the zombies will be stopped. They will try to tear it down, so why not poke at them with a spear through the gaps? It’s what Rick Grimes would do. As well as keeping the zombies away, you will have to cope with managing resources, ensuring you have sufficient materials to keep attacks away, as well as keeping a handle on your personal needs - food and hunger gauges provide a constant threat, forcing you to sometimes take risky actions for the sake of your stomach. You will need to head out into the world. You will need to sneak into infested areas to get supplies. You will be forced to step outside of your comfort zone. Outside of this rich, deep single-player campaign, Metal Gear Survive also lets you team up with three friends for some multiplayer zombie slaughter. Bring your character across from single-player and show off all your unlocks before showing off your skills as you defend compounds from the undead. 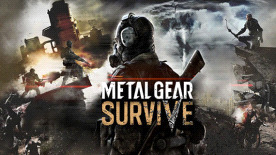 Metal Gear Survive is not the Metal Gear you know and love, it’s a different beast altogether and will appeal to people who perhaps never clicked with the series previously. After all, everyone likes zombies, right? Especially when you can murder them with your pals.